Let's just take it for granted that things are a bit rocky in the Marvel Universe. Though the classic Avengers have finally reassembled, Norman Osborn has been removed from power and the sun seems to be rising over the horizon, things are far from perfect both within Avengers mansion and outside its golden gates. And as the unrelenting dust storm begins to start up yet again, the publisher's most visible heroes have a bevy of new foes to confront as well as several fresh, prickly situations to diffuse. 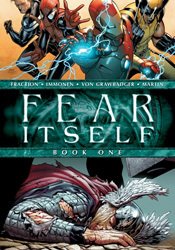 Matt Fraction's tale in Fear Itself is a natural progression of the “superheroes as social commentary” vein most recently tapped in Brian Michael Bendis's big crossover arcs, in which the biggest names of the Marvel U find themselves entangled not in the robotic arms of Doctor Octopus or another evil mastermind, but rather in the hot button political issues of the day. Where Bendis and the dozens of preceding authors would skirt a direct confrontation by way of allegory and metaphor, though, (take Civil War as a dissertation on the sharp divide between America's political factions, for example) Fraction has thus far been much more up front. He's not using mutants as a stand-in for the civil rights movement, he's actually dropping Steve Rogers in the middle of the ground zero mosque demonstrations. Tony Stark is using his new popular resurgence and the desperate need to rebuild Oklahoma after the events of Siege as a vehicle to create American jobs in the midst of a recession. We're not exactly dancing around the issues any more, and whether you see that as a positive turn or a negative one will depend entirely on the level of maturity and / or escapism you expect from your mainstream comic events. Of course, it should go without saying that such weighty issues are also counterbalanced by a healthy dose of good old-fashioned superhero mystique. With forty pages of content, this issue has plenty of room for both, and Fraction pulls off his act with impressive poise. The topical matters thus far haven't felt shoehorned in, heavy handed or one-sided, and the more fantastic scenarios around every other page don't seem completely ridiculous or out of place alongside them. This doesn't feel like an opportunity to spray an unsolicited political agenda so much as it does an instinctive next step forward for the publisher's heroes. It's the battlefield on which popular opinion and ancient mythology come to blows. Aiding Fraction with his work is the uber-talented Stuart Immonen, one of Marvel's most recognizable top-notch superstar artists. Immonen has that magic touch, a knack for conveying whatever mood the writer is looking for via subtle shifts in his artwork. When Fraction is trying to invoke fear, Immonen uses a darker tone and more daunting, worm's eye camera angles. If he's after humor, the panels grow lighter and you'll notice more little throwaway jokes going on behind the action. Even in the more stern, straightforward conversation-based scenes, of which there are plenty, the artwork keeps the pace moving with passion and vigor. It seems like I never have a bad thing to say about Stuart Immonen, and with good reason. The guy never takes a panel off. He's constantly one-upping himself, improving his game and impressing under the glare of a hot spotlight. This issue is no exception. I'll admit to being a bit burnt out by crossover events of late. Just between the two big publishers alone, it seems like nary a month has passed without some manner of major, series-spanning super story over the last five-plus years. The gimmick is tired, but that doesn't mean it's without the capacity to bring the goods from time to time. Whether or not this storyline delivers on its promise remains to be seen – Marvel's track record on that one isn't exactly spotless – but as setups go, I found this to be thoroughly intriguing. Fraction is asking a bookful of questions without a simple answer to be found. How he chooses to answer them (or if he does at all) will determine how the series is ultimately remembered. Buy it.